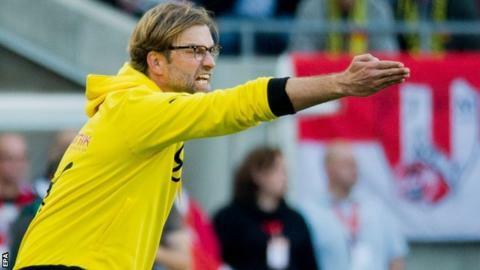 Borussia Dortmund coach Jurgen Klopp criticised his team for playing "pointless" football as they slipped a third straight Bundesliga defeat. Dortmund, who finished as runners-up last season, are fifth-bottom after a 2-1 defeat at newly-promoted Cologne. The poor start has been described as the club's "worst situation in years" by director of sport Michael Zorc. "We played a kind of football which is absolutely pointless," said Klopp. "We've got to face the music again." Dortmund have been hampered by injury problems this season, but welcomed back Germany midfielder Ilkay Gundogan after more than 17 months out with a back injury. Attacking midfielders Marco Reus and Henrikh Mkhitaryan also started after fitness problems, but the trio were unable to stop Dortmund losing their fifth match in eight Bundesliga games. Kevin Vogt opened the scoring for Cologne, but Klopp's side equalised through Italy forward Ciro Immobile early in the second half. The hosts were gifted a 74th-minute winner when Dortmund keeper Roman Weidenfeller's poor clearance allowed Simon Zoller to score. "We misplaced many passes in the first half and made simple mistakes," said Klopp. "They can be explained in a host of ways, but still should not be happening. "We just made it too easy for our opponents. We've got to eradicate these mistakes. We've got to resolve this and nobody's going to help us."